Job seekers with disabilities in Victoria recently had the chance to practice their interview skills with real employers during an event held by GT Hiring Solutions and TeenWork. 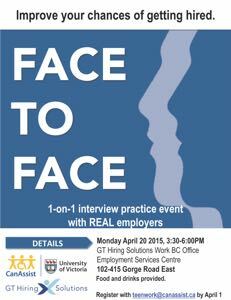 The Face-to-Face Interview Practice Event was designed to provide participants with meaningful and immediate feedback on their interview skills from employers with years of hiring experience. At the same time, the event gave employers the chance to expand their awareness of inclusive strategies for interviewing and hiring individuals with disabilities. The event was inspired by a similar one offered in Vancouver program through the BC Centre for Employment Excellence. Several employers from the community contributed their time and expertise to the Victoria event, including Walmart, Winners, Maximum Furniture, Good Life Fitness and CanAssist at the University of Victoria. "The Face-to-Face event was a lot of fun. It was great for the participants, the job developers and the employers," said TeenWork Manager Alyssa Hindle. "I feel that everyone had a different perspective to share and so we all had something valuable to learn." Ten participants each had the chance to take part in three 15-minute interviews, followed by a group feedback session from the employer panel. Employers said they often value personal characteristics - such as dedication and enthusiasm - over skills and experience. One employer emphasized how sharing a unique story can help an applicant stand out in an interview. Several employers said they were impressed by the level of passion and dedication that the job seekers brought to the table. With five service providers participating in the event, and an article profiling the event on the website of Community Living British Columbia (CLBC), TeenWork views Face-to-Face as a successful collaboration within the supported employment community. In fact, TeenWork hopes to hold another Face to Face event this fall to give more job seekers and employers access to this invaluable experience.